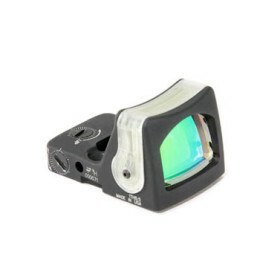 Trijicon RM04 RMR Dual Illuminated Sight - 7.0 MOA Amber Dot » Protective Solutions, Inc. Developed to improve precision and accuracy with any style or caliber of weapon, the Trijicon RM04 RMR (Ruggedized Miniature Reflex) 7.0 MOA Amber Dot Dual Illuminated Sight is designed to be as durable as the legendary ACOG. The RM04 is a battery free sight, featuring Trijicon fiber optics and tritium. Housed in rugged forged aluminum, the RMR is extremely tough yet lightweight. New easy-to-use adjusters with audible clicks allow for quick windage and elevation adjustments. The new Trijicon RMR is tougher than any alternative and suitable for military, law enforcement and hunting applications. Offered in Dual Illuminated with dot size of 7.0 MOA.